Item # 306061 Stash Points: 2,995 (?) This is the number of points you get in The Zumiez Stash for purchasing this item. Stash points are redeemable for exclusive rewards only available to Zumiez Stash members. To redeem your points check out the rewards catalog on thestash.zumiez.com. 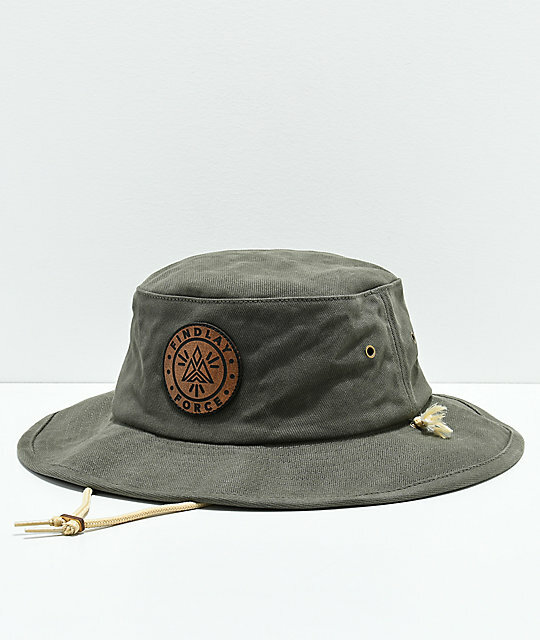 Keep your wardrobe adventure ready with Findlay's newest Dog Wood Olive Bucket Hat. Made with a classic boonie style construction that features a leather logo patch on the crown and a hidden internal compartment for storing small valuables. Dog Wood Olive Boonie Bucket Hat from Findlay. Stitched leather logo patch on front. Hidden internal pocket behind logo patch. Reinforced metal eyelets on sides of crown. Adjustable drawstring chin strap for a personalized fit.